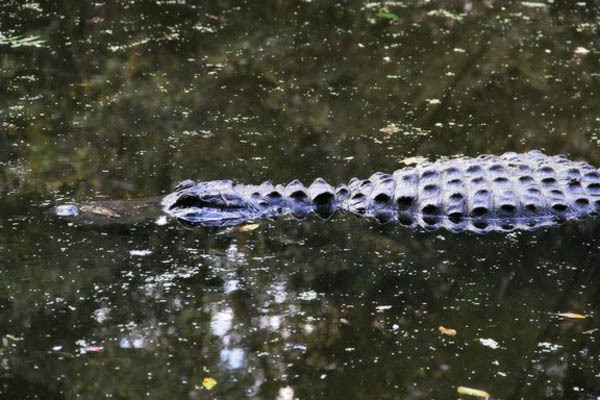 Don’t Fear The Gators in Melrose, Florida. Eat Them For Dinner at Blue Water Bay Restaurant or Try This Recipe! But some gators are wild, and others–farm raised–are meant for dinner. And there’s no better place to try them at Byron Terwilligar’s Blue Water Bay restaurant on SR26 in “downtown” Melrose, just east of Gainesville. Chef Byron and I agree on several things. One, when someone says that wild-harvested alligator tastes “gamey” what he or she really means is “muddy”. Simply put, they are what they eat. And two, they’re delicious if properly and carefully prepared. Byron has spent years cultivating sources of sustainable, natural foods. The alligator on his menu is farm-raised with no antibiotics and is very low in fat. He prefers the tenderloin of small animals, usually 2-1/2 to 3 years old. Sweet and tender even when seared at high heat, the meat is an excellent choice for a pasta recipe. While many tomato-based sauces depend on sugar or carrots to reduce the acidity, Byron leaves that task to the sweetness of our native Datil pepper. But beware–while sweet and flavorful, Datil peppers are extremely hot (100,000-plus on the Scoville Scale). Handle them with gloves while chopping and preparing this recipe. A final comment about your choice of pasta. 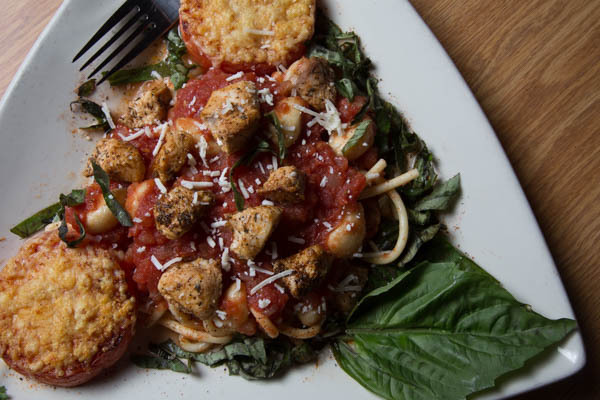 Tomato sauces like marinara “appreciate” noodles that have some texture and hold more sauce. Bucatini is a hollow version of spaghetti and spaghetti rigate has ridges. Either is available at larger supermarkets and specialty groceries. In a saucepan, with half the olive oil over medium-high heat, sauté the tomatoes, raw garlic slices and half the basil until tender. Reduce heat. Add salt, red pepper, white pepper, and bay leaves. Cover and simmer. In a skillet with the butter and the other olive oil, over high heat, sear the alligator chunks until browned . 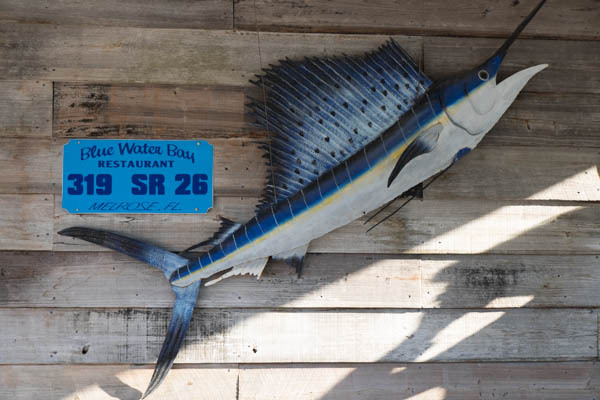 A trip to Blue Water Bay is always worth the short drive from Gainesville, and even if you don’t order gator, there are plenty of other menu selections. 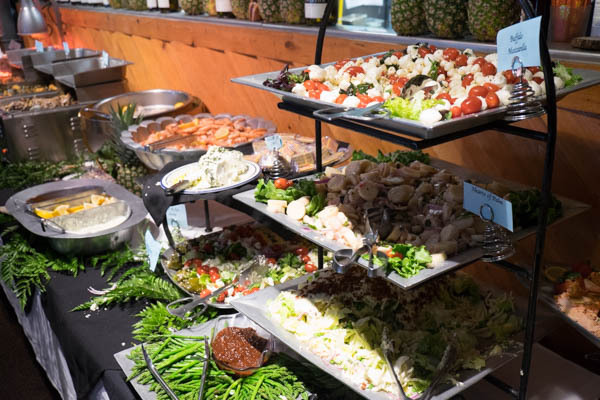 And don’t forget the weekend buffets—the selection of food is amazing and you’ll find something to please even the pickiest eater! A typical Blue Water Bay buffet!